At the Wrens’ new place, things are very different. The name of the street—East 213th—has absolutely zero magic. And there’s no Mrs. Petrone to cut her hair, no Pi Baggott to teach her how to skateboard, no Green Kingdom to explore. She’s having trouble fitting in at her new school and spending a lot of time using the corner bus shelter for her Thinking Spot. Worst of all, Mo discovers that the ramshackle restaurant Mr. Wren bought is cursed. Only Dottie, with her new friends and pet lizard, Handsome, is doing the dance of joy. For the first time in her life, Mo feels lost and out of place. It’s going to take a boy who tells whoppers, a Laundromat with a mysterious owner, a freak blizzard, and some courage to help her find her way home for good. This sequel to What Happened on Fox Street follows Mo and her family as they move to an apartment over the previously “cursed” restaurant (The Wren House) that her widowed father hopes to open. Mo, who avoids change, is miserable in the new neighborhood. Her whole life had been spent on Fox Street where she knew and liked everyone. Warm memories of her mom, her best friend, her “crush”, her neighborly grandma, and the “Green Kingdom” at the end of the cul-de-sac make her dread her new home. 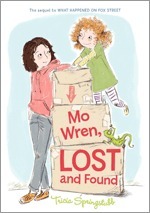 Mo has always been a responsible replacement in the Wren household for her deceased mother, but her father wants Mo to be free to be an eleven year old girl. Unfortunately, Mo’s father’s business dreams are bigger than his skills as a handy man. Luckily, Mo has become friends with Carmella and “goofball” Shawn at the “Soap Opera”, the local laundromat. High energy Shawn shows her around the neighborhood, and Carmella introduces them to Homer, “who knows how to do some of everything, from plumbing to electrical”. With Homer’s help and the presence of new and old friends, Mo begins to finally see that even though change is hard…sometimes it turns out just right. Older elementary and middle school children will enjoy reading about Mo’s adventures and her experiences while opening the restaurant.